What a simple and elegant conversion that still achieves maximum awesomeness. All they have done here is a simple head swap by adding a helmet to the existing Slaughter Priest head. I imagine they either had to hollow out the helmet, or cut down the head and helmet, or both to make it fit, but it looks great! I'm not sure what that helmet comes from, or if the flames in the middle are part of it, but if not, that's another great piece of converting right there. 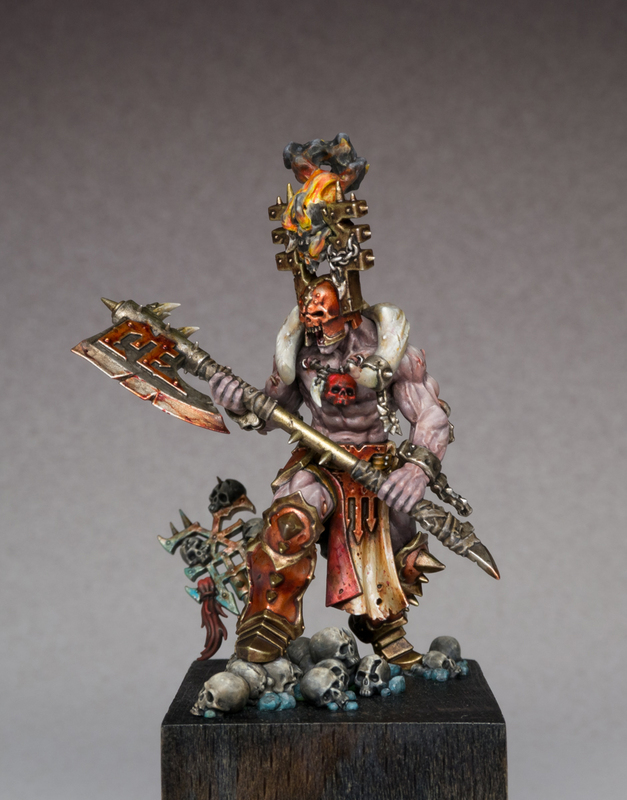 The painting on this guy is fantastic as well, achieving a very realistic effect while still keeping the AoS vibe. I love how pale and ruddy his skin is. It has a real unhealthy feel to it, but still manages to make the Priest look powerful. The reddish orange metallic look to the armor is something I haven't seen before and I really like it. It almost looks like he has just smeared a coat of blood across all of his armor. The blending on everything is smooth, and the highlights are crisp. They've topped it all off with a level of grime that pulls the model back down to the real world. The presentation of the model without a base and just a bunch of skulls on the plinth is very simple and does a good job of highlighting the model. All in all, this may be my favorite rendition of the Slaughter Priest model I've seen so far.